I was actually beginning to write this interesting science post last Sunday morning, back when it was so cold outside, but then Cyndie burst in to announce we had a horse emergency. Boy, did we. I spent a little time with the three chestnuts after I got home from work yesterday. They were mostly preoccupied with munching the freshly served hay that Cyndie had just put in the boxes, but there were some brief moments of acknowledgement from each of them. They seemed a little hapless to me. It could just as easily be a projection of my own forlorn perspective, but they are obviously in the middle of trying to adjust to the sudden absence of their principle decision maker, so hapless feels like a logical possibility. It snowed a lot on Sunday and Monday this week, so I also did some shoveling yesterday afternoon. The deck on the back side of the house had not been cleared since the snow piled up. I wanted to get that cleaned off before the next thaw arrives, which we are anticipating for the next few days, starting with this afternoon. 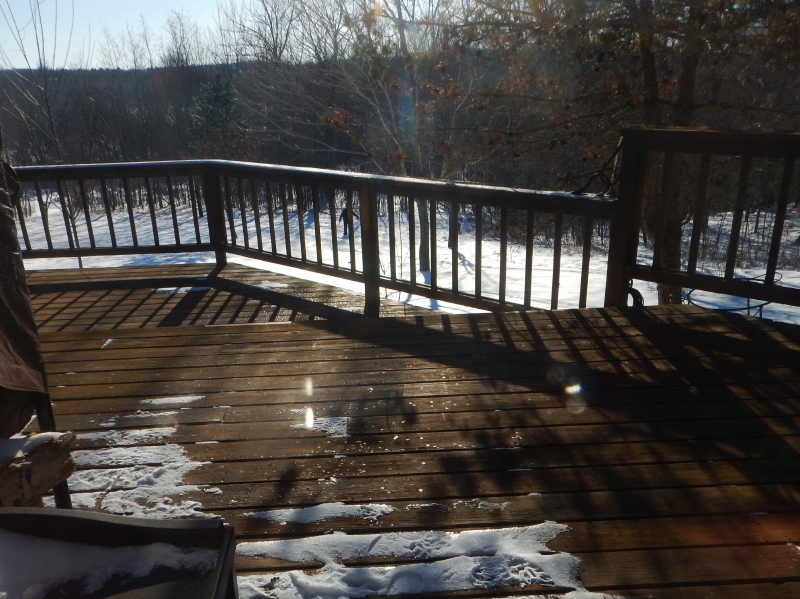 The last time I was writing about the deck was because it had remained surprisingly clear throughout the prior snowfall, partly because it had been so windy, and partly because that precipitation started as a drizzling rain. If you are a regular reader, you may recall that I posted a picture of it. Well, by the afternoon of the very next day, the deck surface had changed so dramatically that I took another picture for comparison. I’ve written about this before, because it is a winter phenomenon that fascinates me. The ice sublimates from a solid to a gas without actually becoming liquid in between. It just disappears into cold, thin air. If you enlarge the photo on the left, you can see the bumpy glaze of ice on the boards that formed as the relatively warm and wet precipitation started to fall. I originally posted that photo because I was amazed the several inches of snow that came out of the sky by the end of the event, never accumulated on the deck. The wind kept the deck surprisingly clean. 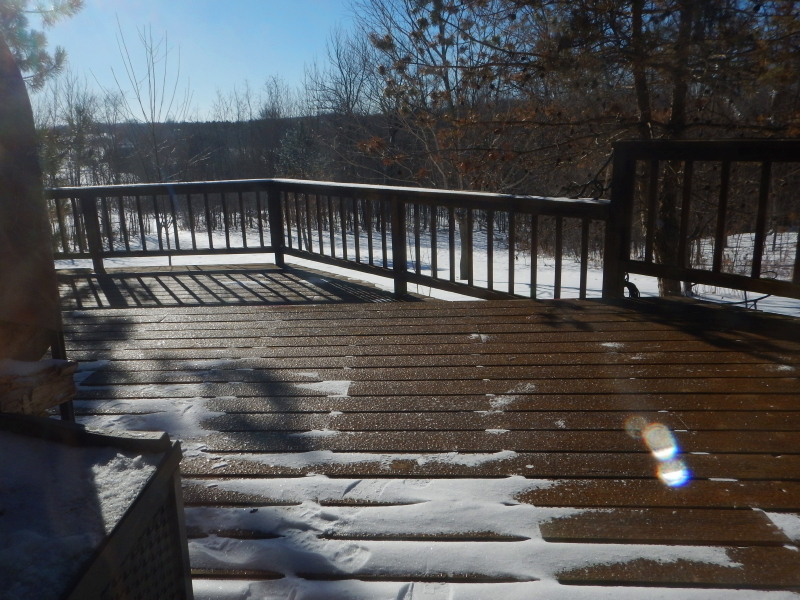 By the afternoon of the next day, despite temperatures down around zero degrees (F), I glanced out and noticed that a large majority of the deck boards were now dry. There were hardly any of the icy bumps from the day before. They hadn’t melted. The deck was completely dry. The frozen bumps had sublimated.